How Do You Optimize the Structure of the World's Largest All-Composite Aircraft? Stratolaunch aircraft rolling out of the hangar in spring 2017. Image courtesy Stratolaunch Systems Corp.
Manufacturers of the Stratolaunch air–launch platform used Collier Research's automated sizing and analysis software to inform laminate design and production, optimize the fuselage and wing structure, and reduce weight. 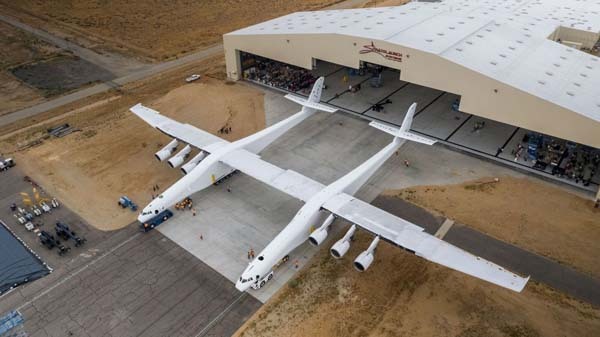 NEWPORT NEWS, Va.–When the Stratolaunch aircraft rolled out of the Mojave, California Air and Space Port hangar last spring in preparation for ground testing, it was a clear example of how far the design and manufacturing of composite materials have progressed in recent years. In September, the first phase of engine testing on the aircraft's six Pratt & Whitney turbofan engines was completed. The world's largest aircraft by wingspan (wider than a football field is long) is almost entirely fabricated from composite materials, which provide light weight, high stiffness, and strength characteristics that are increasingly in demand in aerospace, automotive, sports, medical, and industrial fields. But when you're building the world's largest all–composite aircraft, how do you know it can carry the load? One option is to test the materials using HyperSizer, a computer–aided engineering (CAE) software product from Collier Research Corporation. The simulation software has already been used to test materials used in Bell's V280 helicopter, the NASA Orion crew module, the Ares 1, the Ares 5, and many commercial rockets across the globe. And recently, engineers used HyperSizer to simulate, analyze, and optimize the composite structures that make up most of the Stratolaunch aircraft. Stratolaunch (www.stratolaunch.com) is the brainchild of Paul Allen, Microsoft co–founder, and Burt Rutan, the noted aircraft designer who founded Scaled Composites. It is a 238–foot–long jet aircraft with two fuselages that are connected by a giant single wing. Designed to serve as a mobile launch pad for carrier rockets, Stratolaunch is powered by six engines that will enable it to take off from a runway carrying a payload of up to 550,000 pounds. The plan is to fly to 35,000 feet, the cruising altitude of a commercial airliner, and release the launch vehicle's payload, and then return to the airport for reuse. It is expected to operate in 2019. Collier Research's HyperSizer optimization software was used extensively by Stratolaunch manufacturer Scaled Composites (www.scaled.com) to optimize the aircraft's composite fuselage and wing structure. For the massive Stratolaunch wing, deflection limits were a significant factor to be taken into account. The panels of the duel fuselages were sized for strength, stability, and honeycomb sandwich failure modes. By using HyperSizer, the stress team had access to a comprehensive set of automated failure analyses that includes rapid free–body analysis, discrete laminate sizing, ply–based composite failure analysis, honeycomb sandwich analysis methods, such as wrinkling, core shear, flatwise tension, and intracell dimpling, and scripting API to push in loads from Excel spreadsheets. 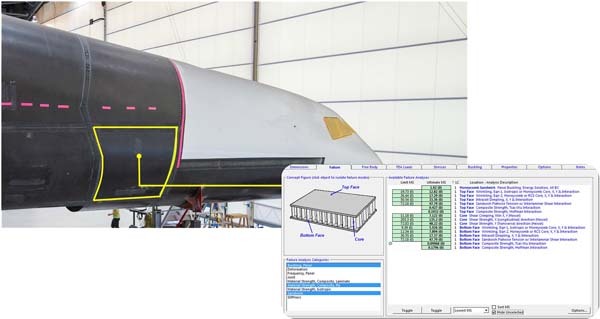 Early construction phase of one of the two fuselages of the all–composite Stratolaunch aircraft and (inset) a screenshot showing a HyperSizer analysis of the structure. Images courtesy Stratolaunch Systems Corp. When fully loaded, the Stratolaunch will weigh 1.3 million pounds. HyperSizer offers the capability to perform a structural integrity analysis to determine if a structure is strong enough to carry a specified load. The software enables designers and engineers to use advanced metal and composite strength and stability theories simultaneously to predict and avoid critical failures, while finding the lightest weight for a design in the shortest amount of time, according to Collier Research (hypersizer.com). The software helps designers decide what laminate and ply stacking of the material is required, said Collier Research President Craig Collier, in an interview with Design–2–Part. Another attribute is that it creates interim stress reports with detailed calculations attached. That means a skeptical engineer can personally run the numbers and gain confidence in the answers. "Engineers are never satisfied with an answer. They're always challenging the answer," said Collier, who worked on developing HyperSizer software while at NASA. Composite materials provide design and structural advantages over aluminum and steel, Collier argues, saying they are light, stiff, and strong. The HyperSizer software automatically performs design, stress analysis, and sizing optimization, typically reducing the weight of structures by 20 to 40 percent. That saves design time and lowers the cost of flying. "First, the engineer has to establish he is confident the software is right, and then he uses that to convince the customer he did his due diligence and that he got the right answer," Collier said. The software is transparent enough for the engineer to see the inputs, run numbers, and build confidence. Craig Collier sees a continuing evolution in how engineers and manufacturers are integrating the toolsets used for composites design and manufacturing. He believes HyperSizer has real benefits for aircraft designers, enabling them to evaluate the strengths and weaknesses of materials for specific uses. "HyperSizer software can provide insight into how producible a structure is, and whether there might be any manufacturing issues," Collier said. "It can incorporate laminate fabrication preferences in early–stage design thought; ease–of–manufacturing is becoming a major influence with strength design of laminate structures." Collier said the future of HyperSizer is in aerospace, but it is also being used in wind turbine blade manufacturing, in automotive, and in other industries interested in lighter weight. The HyperSizer program helped Bell Helicopter design its V–280 Valor to meet structural requirements for strength, stability, stiffness, and deflection and rotation limitations for severe flight, landing, and ground load cases. The software helped NASA test the 16.4–foot diameter thermal protection shield on the Orion crew module. The module, which is where astronauts sit when falling to earth at 25,000 miles per hour, is reported to reach temperatures of 4,800 degrees Fahrenheit. It then crashes into the ocean while attached to a parachute. HyperSizer software helped design the shield. Collier Research (www.HyperSizer.com) provides software, methods research, and consulting services for the aerospace, wind energy, automotive, and recreational equipment industries.